Home › Knowledge Hub › Top tips › Copywriting – where to begin? Copywriting – where to begin? Every charity needs marketing materials but few will have in-house copywriters to write them. In most charities, the job of writing leaflets, brochures and websites falls to the director, fundraiser or someone in marketing. If you are one of these part-time copywriters, and sometimes struggle to know where to start, this article is for you. Perhaps unusually for an article about copywriting it doesn’t cover specific writing techniques, such as word choice, headline writing and active rather than passive sentences. Copywriting can be defined as "clear thinking on paper". And clear thinking starts with identifying your audience, deciding the purpose of your publication and defining your key messages. 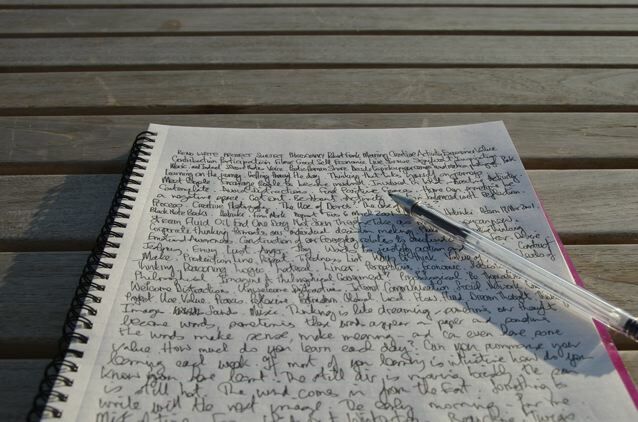 If you’re struggling to write copy then the best ploy is to stop, and start making notes instead. Get the thinking right and the copy will follow much more easily later on. Make a note of the audience (or audiences) for your leaflet, poster, brochure or website. Try and be specific. Rather than just writing vague terms like ‘supporters’ or ‘professionals’ try to narrow it down further. What kind of supporters and what kind of professional? Be as specific as you can. You might identify the audience and purpose quite easily – five to 10 minutes could be enough. But the next step might take a little longer and require a bit more thought. What, exactly, do you want to communicate? What, precisely, do you want to say? At this stage it can often be helpful to pick up a pad and pen and head for the nearest coffee shop. Stepping out of the office can give you extra "head space", somewhere away from emails where you can gather your thoughts (and let new ones arrive). Even a bus or train ride can be a good chance to plan a publication. Personally, I find a pen and paper helpful at this stage, but other people may prefer a laptop or other digital device. Write down the main points you want to get across to the audience. This sounds easy but may actually require some thought. Remember, at this stage you’re not actually writing copy so don’t worry about how you phrase things. It’s the thought that counts. That legacy income is vital to my charity (X% of our donations come from legacies). Making a legacy is very easy – tell people how. Make the point that a legacy is a great way to support a cause that matters to you (it’s a personal way of giving like no other). One of best ways to support our cause. Satisfaction that comes with remembering us in your will – you’ll feel good about it. If you’re planning an annual report this stage may take a couple of hours, but I promise you it’s time extremely well spent. As well as noting down your main messages, think about the evidence you will use to back up your messages. This might include statistics, quotes, dates and other facts. Gathering all this information together in advance will really help when the time comes to write. In particular, it will help you to structure your copy. You might find it helpful to do a mind map. This shows on one side of paper the main messages and supporting information. I find mind maps really useful because they help me get to grips with a subject and feel comfortable with all the evidence I will need. So far you’ve identified your audience and purpose of your publication, decided on the main messages and started to gather supporting information, such as statistics and quotes. How much will you write? Copywriting is writing for design and one of the first rules of copywriting is "don’t write too much". Present a graphic designer with 2,000 words for a double-page spread of your A4 annual report and the result will be indigestible. Give them 500 and there is a much better chance you’ll like the result. Here’s a helpful tip to make sure you don’t over-write. Find a publication you like – one which feels inviting to read. Choose a publication similar in format to the one you are writing. If it’s an annual report, chose a spread from another document that has a nice balance of words, pictures and white space (the gaps between the words and pictures that allow the design to breath). If it’s a DL leaflet (ie A4 folded three ways), find another DL leaflet that is easy on the eye. Next, count the words on the page or leaflet. Either count each word individually or count the number of words in ten lines and then multiply up. This applies equally to web pages too. Technically there’s no limit to the length of a web page but few benefit from being longer than one or two screens. Once you’ve counted the words in your chosen document, make yourself a solemn and binding promise not to write a single word more than appears in your preferred publication. This discipline will focus your mind wonderfully on saying exactly what you need to say, and no more. Neil writes copy for not-for-profit organisations including charities, schools, NHS trusts, local authorities and housing associations. He also runs training sessions for copywriters.